I will be using Samsung 18650 cells as the building blocks and doing a 4s30p battery. So 4 cells in series and 30 of these in parallel. Nominal voltage will be 14.4 V.
There are "better" cells that allow more current through them continuously, but I have a free source for these cells so beggars can't be choosers and 4C peak at start should not be so bad when the continuous is 2C. This gives me a safe and small battery (at least in weight), that has room for expansion and capacity for a data logging system and in car PC. 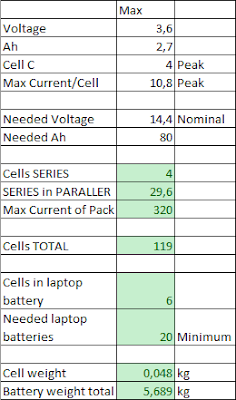 Here are my calculations for the battery. Even though the capacity would be 80 Ah, the weight would be well below 10 kg when finished. Compare this to a traditional battery and the weight difference is huge. We are talking about 20 kilograms. I could also divide this to a two units, where one pack (~60 Ah, 4s22p) would be for starting the car and other high current electronics needed at start and another pack (~20 Ah, 4s8p) would be for data systems and ECU. This battery project I can do in my home so hopefully we will see some progress in this after I have all the needed parts and can begin the assembly! As always, all input is appreciated and welcome!